I’ve finished my swatch and got my gauge for my new Chuck sweater. I was just going to follow the pattern as written, but you know me. I can’t leave well enough alone. 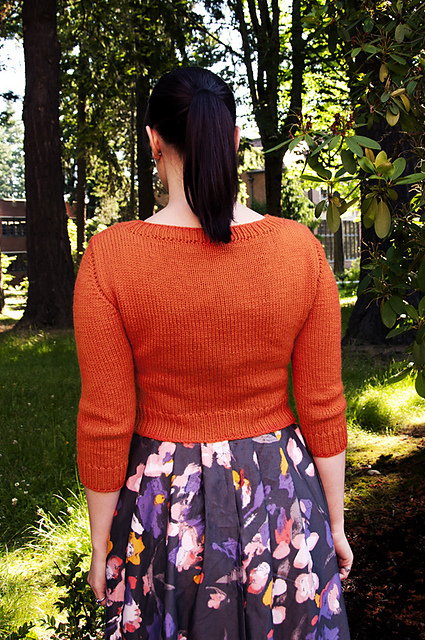 I love the general shape of the sweater- the natural-waist hem is perfect. And, the cables down the front are so cute. But there are things I think I’m going to change. First, I like the boat-neck collar, in theory, but I think it has to. I have pretty narrow shoulders, so I usually end up fussing with drooping shoulders all day if I wear anything with a boat neck. (Also, I’m constantly cold, so I’ll take any opportunity to be a little more covered-up.) So, that means I’ll keep the neckline shaping more or less the same, but move the sides of the neck in toward the middle just a bit. To do that, I’ll cast on more stitches for each shoulder, and take away the same number of stitches from the bottom of the neckline. A little math, but nothing too tricky. Also, I gotta say, that big ol’ stockinette back makes me a little sad- I think it needs some extra decorations! (Of course, I tend to like my sweaters to be totally covered with texture or color, so maybe I’m not one to talk.) So, I’m going to add a cable (or maybe two) down the back. Nothing as elaborate as the front of the sweater, but just something to add a little something special. I also think I might make the sleeves a touch longer (but I do that on almost every sweater, since I’ve got long orangutan arms). I won’t have to decide about that for a while, though. I hope it’ll turn out OK- I love the original pattern so much, I don’t want to ruin it. In my head, my changes will only make it better- but we’ll just have to wait and see when it’s done. In the meantime- cross your fingers for me! 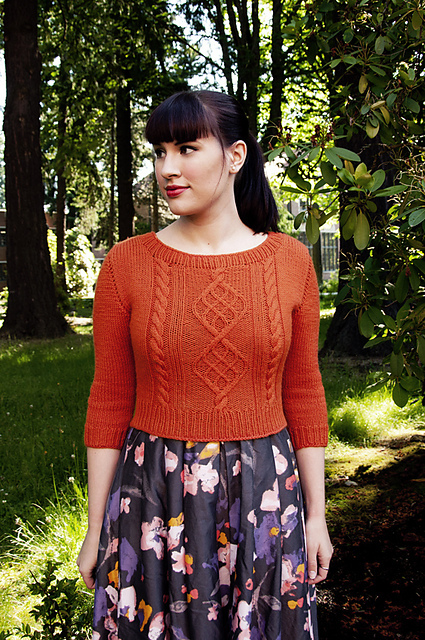 Have you ever given an existing pattern your own spin? How did it turn out? This entry was posted in On My Needles and tagged changes, chuck, chuck sweater, pullover, sweater on April 5, 2017 by onemilljellybeans. MAY I REBLOG THIS POST—LOVE THE COLORS AND FIT!